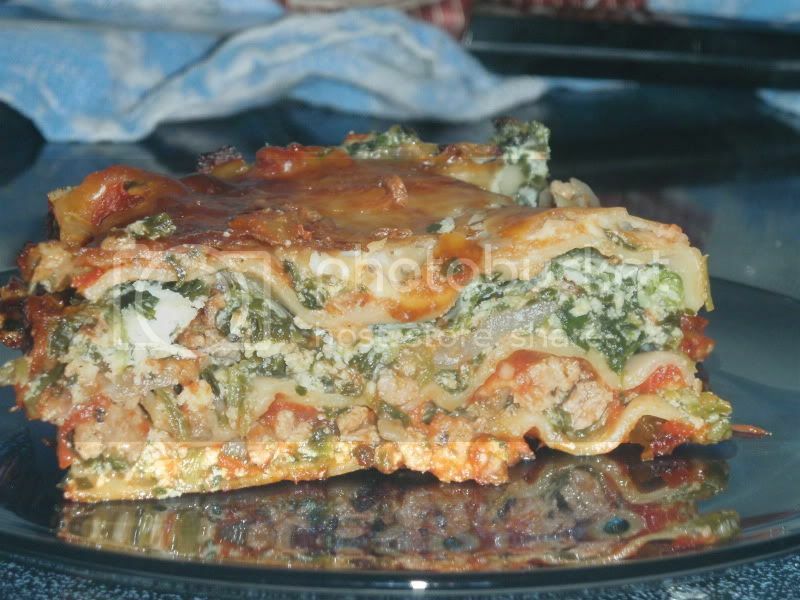 This recipe is similar to my Turkey-Spinach-Mushroom Lasagna, but without the mushrooms and a little more seasoning. Something was sweet in this recipe, probably the prepared tomato sauce, but I can't be sure as I did a number of things that I normally do not do. First, I sauted the onions longer than necessary just to soften but short of carmelization. I'd say about 10 minutes, then another 5-7 with the ground turkey and garlic. I worked harder than I usually do to squeeze liquid out of the frozen spinach. Finally, I added a pinch of nutmeg to the spinach (a trick I have long resisted). The end result was quite yummy, although I might mix the sauce with the meat mixture in the future for even spreading. Saute onions in olive oil over medium high heat until softened and beginning to brown. (I kept the heat fairly high and stirred constantly to prevent scorching). Make a hole in the center of the onions and dump in ground turkey. Using a wooden spoon or spoonula, crumble the turkey. Add garlic just before the meat has finished cooking, about 1 minute. Season entire mixture with a generous sprinkling of salt, pepper, basil, and oregano. Continue cooking until meat is browned and most of the liquid has evaporated. Stir in 1 c sauce, and remove from heat. Meanwhile, defrost spinach in a medium mixing bowl covered with a wet towel and a few tablespoons of water. Drain as much liquid as possible. Mix the ricotta, egg, spinach, nutmeg, and another sprinkle of salt and pepper together until well-mixed. Pour about 1/2 c of sauce in the base of a 9x13" baking pan that has been sprayed with cooking spray. 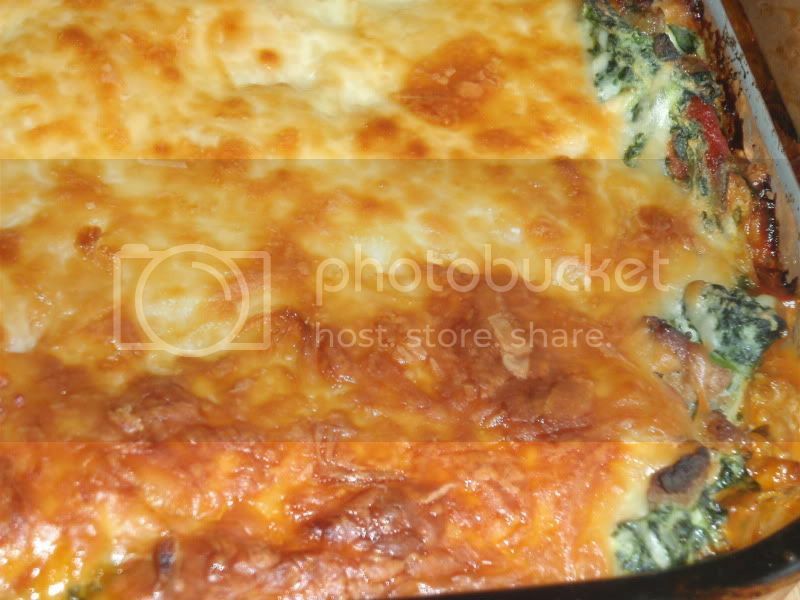 Paint 3 lasagna noodles with the spinach mixture and lay face-up in sauce. 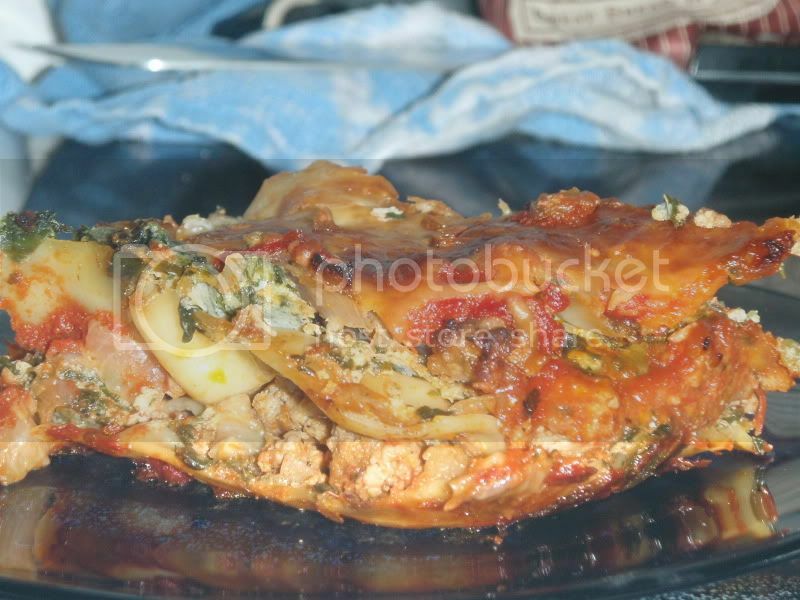 (You'll do this for each lasagna noodle, so budget your mixture accordingly.) Spoon about 1/2 of the meat and onion sauce, top with a sprinkling of parmesan cheese. Repeat. The final layer will likely have a face-down spinach rub (or your could do so with the bottom layer). Pour remaining sauce over non-spinach side of the noodle. Top with mozzarella and all remaining parmesan cheese. Spray a foil cover for your pan with cooking spray. Cover tightly. Bake 30 minutes until mixture is bubbly. Remove cover and continue baking until golden brown, about 30 more minutes. Allow to rest about 10-15 minutes before slicing with a sharp knife. You may need to use a spatula to prevent ingredients from falling out while serving.